Sorry... the 2017 Honda Ridgeline is no longer being sold as new. Instead, take the first step to a great deal on 2019 Honda Ridgeline with a free price quote! After a two-year hiatus, the Honda Ridgeline is back with a new look, more technology and a better midsize pickup truck package. The 2017 model is making its debut at the 2016 North American International Auto Show in Detroit. Sharing several design strategies with the all-new 2016 Honda Pilot, the new Ridgeline has a more conventional pickup truck look, but offers many of the same class-exclusive minivan/SUV/pickup features that the previous model contained. Like the previous Ridgeline, the unibody platform will allow owners to enjoy the most interior cargo space of any midsize pickup and provide the widest bed for outdoor cargo — the new bed is 4 inches longer. The inside of the new Ridgeline also has the lowest floor of any pickup, providing plenty of legroom and a large, versatile center console and armrest. Additionally, Honda has upgraded the Ridgeline's features, materials and interior finishes to appeal to a wider, more demanding audience. Among some of the improvements are tri-zone climate controls, push-button start and a full-color 8-inch touch-screen display screen with Apple CarPlay and Android Auto compatibility. The rear seats have a 60/40 split and lift up to allow for more floor storage like the previous model. The new pickup will be powered by an all-aluminum 3.5-liter i-VTEC direct-injection SOHC V-6 engine similar to that found in the Honda Pilot. In the Pilot, respective horsepower and torque numbers are 280 at 6,000 rpm and 262 pounds-feet 4,700 rpm. The 2017 Ridgeline will also have a new six-speed transmission and the same torque-vectoring all-wheel-drive system, called i-VTM4. The all-wheel-drive system will allow for multiterrain management using Normal, Sand, Snow and Mud modes. Honda describes its system as "all-weather" technology to provide better handling, traction and performance. Of note, for the first time Ridgelines will be available in both front-wheel and all-wheel-drive configurations. Although pricing and specifications have not been released yet, we're guessing Honda will follow the same trim level strategy we saw in the 2016 Pilot — LX, EX, EX-L, Touring and Elite — with the new Elite option costing a good chunk of cash. The 2017 Ridgeline will also offer a host of safety and driver-assist technologies that are likely to make this one of the safest pickup choices around. Available safety options include lane departure warning, collision mitigation braking, lane keeping assist, road departure mitigation and blind spot warning., All Ridgelines will come standard with a multiview, multi-angle rearview camera. 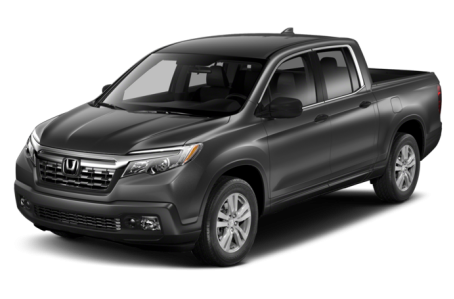 The Honda Ridgeline, due to its sport-utility-truck style and construction, remains a street-biased, light-use, midsize pickup with a reasonable amount of hauling and towing ability (especially when compared to other more traditional body-on-frame choices), but we're guessing it will fit the needs of many buyers. Given the sales and attention resurgence of the midsize pickup segment, lower fuel prices and the volume of family-friendly features packed into this new pickup, we wouldn't be surprised if Honda sells more than twice as many Ridgelines than it did in any of the last three model years (2012-2014) it was on sale. 104 of 110 (94%) consumers said they would recommend this vehicle to a friend.